A writers opinion and perspective on the changing human society and where it will eventually lead humanity and his idealism. Online jobs are the most innovative means of finding employment through the internet and is considered as a good alternative compared to having to wake up early in the morning to catch the daily commune to and from the office. Because of the improved speed and capabilities of the internet to handle faster speeds of data, it has now become possible to work in the comfort of your own home. Regular office jobs such as VA (virtual assistance), writing, programming, software development, graphical designs, video editing and just about any office based jobs can now be done at a convenient time without you having to leave your home. Unfortunately, the state of online jobs have greatly changed after a decade and nowadays, are only filled with scheming middlemen and opportunists that victimize job seekers. 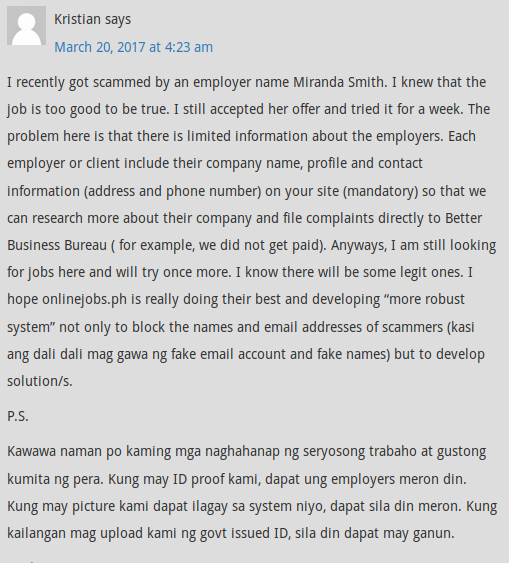 Onlinejobs.ph has got to be the most "scammer infested" job portal website in the internet for almost the past 5 years or so. The site charges a fee to clients that are in search for Filipino online workers and most employers can hire a Filipino worker for below average rates, as in the lowest compared to other more "legitimate" job portal sites. 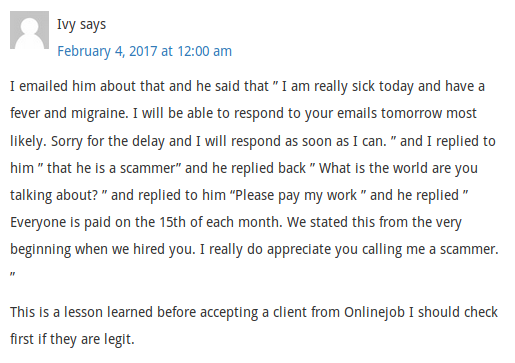 Most scammers on this site oblige their "potential" employees to undergo a "probationary" period before deciding to actually hire them. This often times means insane workloads for low rates as low as $2 an hour. 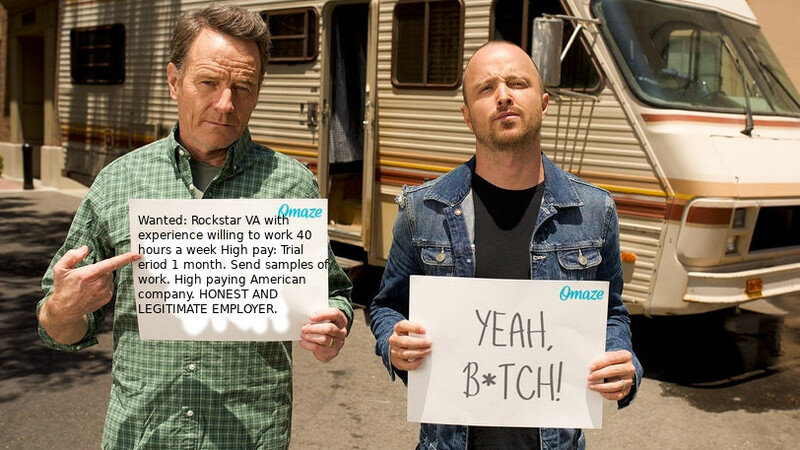 Some scamming employees often "force" you to submit a "trial sample" of your skills to see if you have what it takes to get the job done. They will often delegate you to work on a certain task and leave you without any opinionated review pertaining to the task that you had accomplished. Though it may seem like a very convenient means of earning your keep on a daily basis, there is a darker side, one that has to do with people that pose as legitimate potential employers that want to take advantage of your dire need to earn a living. To make matters worse, there are online job portals such as Freelancer.com https://www.freelancer.com that let jobseekers battle against each other for the cheapest services that they can offer to any potential employer that wants to hire an online worker. This reduces the talent and skill of the online jobseeker to a mere beggar like condition. This can often lead to frustration since most of these unscrupulous individuals would rather dupe you into doing and finishing certain tasks without having to pay you for the effort that you had to go through just to dupe you. As online workers, how can you avoid this? How can you determine if an individual or potential employer is legitimate? The following are just some things that you have to watch out for when trying to find an online job to avoid the chances of you being scammed into doing a job that you won’t be getting paid for. Regardless of who you are or what part of the world you are living, your skills are very valuable and there are employers that see it as an asset to their business. Most honest online employers would be exerting the effort to win your trust as a potential online employee and will make sure that they are serious in obtaining you services by reaching out their hand in sincerity. Most serious employers will pay you to undergo a trial to find out if you got what it takes to fulfil their needs with regard to the skills that they are needing. They would often submit you to a test and pay you regardless of the outcome of it and would immediately let you know if you have passed the test. Most of the time they will say that you have been shortlisted among many potential candidates and will contact you soon to let you know that you have been selected. As this may seem to be a costly undertaken risk on the part of the employer, it is a clear sign that they are indeed honest in their intention of hiring you altogether. One fail proof way to find out if a job posting is a scam is the way how the same job opening ad is still listed on the job board, which is mostly how onlinejobs.ph job boards often display most job openings. This has a 90% possibility that a job opening is a scam and I suggest that you don't bother applying for it. 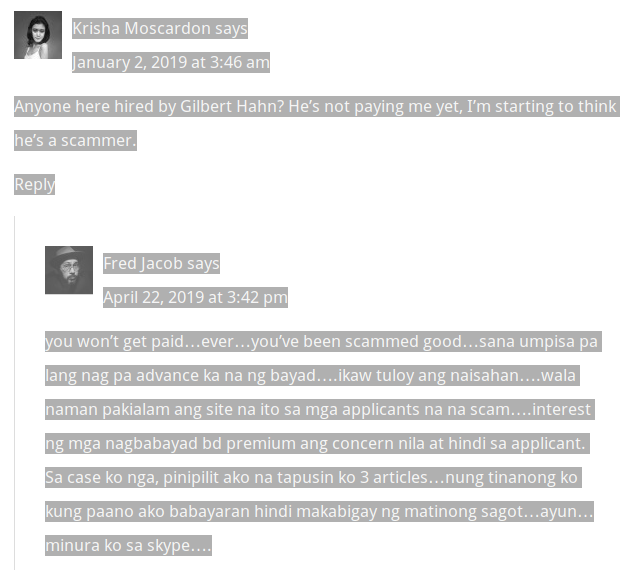 Job ads running repetitiously for months at a time just means that a scamming employer is searching for it's next Filipino victim. Most honest job advertisements would have long been inactivated once they had accepted a well worthy job applicant and will not run their job opening ads for a long time. But given the fact that some job openings display the same tag lines on their advertisements, just goes to show that they are not only fishing for their next victim but are also repeatedly doing this because they have a paid premium monthly membership of $69 that they can easily earn back through scamming Filipino workers by getting them to do free jobs without paying them. This is a classic ploy instigated by scammers to to lead you to do their bidding without any assurance that you will be getting paid in the end. Most online job hunters fall pray to this scheme, leaving them frustrated in the end when all of a sudden, their “employers” suddenly disappear and they are left without even getting paid. Most legitimate employers will check you on a daily basis to see if you are doing your job on a regular basis and would ask you of your progress from time to time. They will pay you on a regular basis depending on your arrangements when they have hired you and will continue to do so as long as you get the job done. This should assure you that you have security of not being fooled into continually doing your job without getting paid. There are a lot of scammers out there that will oblige you to do a lot of things without ever giving you the assurance that you will indeed be getting paid and it is best to avoid these people once you see the tall tale signs of not being assured or if they force you to finish a certain task. Some clear signs of you possibly being scammed with regard to your work is it being submitted to a “editing team” before approval. In reality, a real employer can automatically determine if your work is approved right then and there. A scammer usually lacks the social graces of immediately responding to their potential “victim” employees by taking a long time to respond to the latter's job application, that alone tells that the scamming employer is fishing out a lot of victims. And even of they do, it would take a couple of intermittent days, usually containing mediocre questions about your skills and capacity. This alone should be a clear sign that they are just “playing” around with you and you should move on to your next job application. A serious potential employer will show you examples of a web page and ask you more or less if you understand the contents of it with their need to apply your skills with what they need. Legitimate employers will have their own registered domain and will hire you to work on those sites as soon as they determine that you are competent with the skills that you have. Scammers often open accounts on online job portals to find victims and would usually post funny sounding job details with laughable grammar structures that would immediately raise a red flag in your mind. Grammar is usually a clear sign though we don’t have to be too particular about it since there are many people around the world that do not have a firm grasp with the English language. Nevertheless, you should avoid these people that do not have a clear detail on the job description that they are offering to avoid you from being possibly scammed. 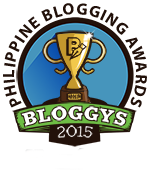 Since you are not sure who you are applying to, you may eventually become an employee of an employee, in which most cases are web content developer companies that are based in the Philippines, India or other third world countries that are taking advantage of the need for quality online employees. Most of these “middlemen” companies will be giving you a lot of workload and will be paying you a very low rate that they are actually earning from you more than you earning from your effort. Most legitimate companies rely on outsourcing their employees through these companies that they do not really care of their employees working condition as they let these outsourcing companies handle the manpower and recruitment. This can also be the case of some scheming and conniving individuals who will take credit for your work and claim it as their own. No one, simply put, there is a 50/50 chance of you going both ways that you could end up getting legitimately employed or you can end up getting scammed in the end. There is actually no such assurance that you will find a decent online job with regard to the skill set that you have and all you can do is gamble with your effort in searching for the right employee and keeping you fingers crossed that you might get hired by an honest employer. Regardless of what people and companies say who or what they are, it is a good idea to research anything that is associated with their name on the internet to determine if they are who they say they are. This reduces the chances that they are a scammer and will let you be a bit relaxed knowing that their credentials match their identity. In conclusion, there are a lot of obvious signs that the person that you are talking to is indeed a scammer. The first thing that you have to see is the quality in which the way that the job opening description was written, the sketchy grammar and the lack of details that most job hunters want to find out so that they are not easily lead into a trap. The sincerity of the employer to put an effort of directly interviewing you if they find you “interesting” enough that they will contact you as soon as possible. Avoid job openings that do not define the actual salary and submit you to such “trial” periods without assurances of being paid. Avoid by being lead on with the proverbial “pat on the back”, that does not fall short of being petted like a good dog. And finally, it is very important that you determine the legitimacy of your “potential” employer if they have a legitimate web page, that alone will be a sign of their sincerity and assures you that you will have a stable and paid job with them.